Facebook is being sued by a British engineering company that claims the social network stole its technique for building data centers and, perhaps worse, is encouraging others to do the same through the Open Compute Project. BladeRoom Group says it contacted Facebook in 2011 about using its technique, which involves constructing data centers in a modular fashion from pre-fabricated parts. It's intended to be a faster, more energy-efficient method. What happened next isn't clear, since much of the public version of BRG's lawsuit is redacted. 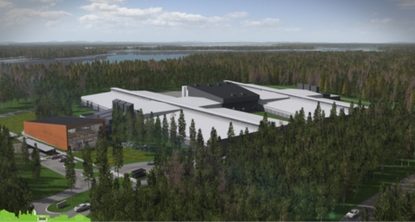 But it claims Facebook ended up stealing its ideas and using them to build part of a data center in Lulea, Sweden, that opened last year. "Facebook's misdeeds might never have come to light had it decided that simply stealing BRG's intellectual property was enough," the company said in its lawsuit, filed Monday at the federal district court in San Jose, California. "Instead, Facebook went further when it decided to encourage and induce others to use BRG's intellectual property though an initiative created by Facebook called the 'Open Compute Project'." BRG is suing Facebook for theft of trade secrets and breach of contract, among other things, and asks for a jury trial. It's seeking unspecified financial damages and an injunction to stop anyone using its technique. Facebook said Wednesday it had no comment on the lawsuit. Big data centers can cost billions to build and operate, and giants like Facebook, Google and Microsoft have been working hard to make them more efficient. Traditionally, large data centers have been brick and mortar buildings that get fully built out and then filled with IT equipment over time. That's not efficient, since much of the building sits idle until it's needed. Now, some bleeding-edge companies build data centers from prefabricated parts that are manufactured at a factory, then delivered and assembled quickly on site. Facebook revealed such a design at the Open Compute Project Summit last January and said it would allow it to add new capacity twice as fast as its previous approach. It shared its ideas through the OCP, which it set up for companies to collaborate on new ideas for data center infrastructure. Soon after, it said it had hired Emerson Network Power to apply the technique in Sweden. BRG claims the ideas weren't Facebook's. The British firm said it closely guards its trade secrets and that Facebook should have to pay for "all profits, cost savings, and reputational enhancement" it gained from its alleged use of BRG's designs. The suit was jointly filed by BRG and Bripco, both based in Cheltenham, England. If the case comes to trial, it will hinge partly on BRG's ability to show that Facebook indeed copied its designs. Many other companies are building or selling pre-fabricated data centers, including Microsoft and Hewlett-Packard. BRG says it started out designing modular hospital buildings and expanded to data centers in 2009. It says it has built data centers for "national governments and some of the world's most prestigious and well known companies." In its presentation at the OCP Summit last January, BRG says, a Facebook engineer mentioned that "lean construction approaches are often used in hospital buildings." BRG says it's the only data center company it knows of that "also had experience building modular hospital buildings."